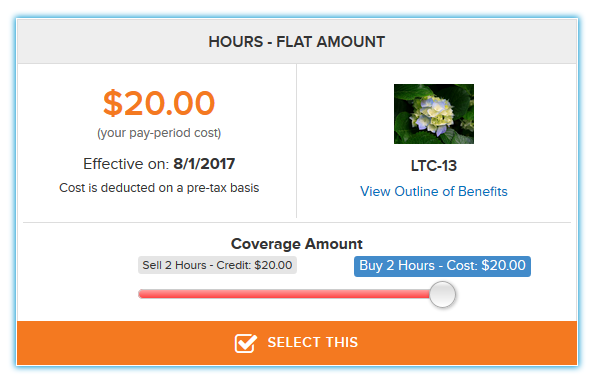 Buy/Sell PTO Plan: This plan allows for the buying and/or selling of Paid Time Off (PTO) in full or partial increments of hours, days, weeks, or months. With this update, a step-by-step guide on Best Practices for setting up this plan for use in bCEnroll is available below. Employee History Start Date – When bCEdge (or any API Integration) is enabled, the initial start date of what will be the API History appears in the Company Information page. A more detailed version of the date(s) is now available in the Employee History section and will show each time an API Integration was activated and whether that included API Only, SSO Only, or API and SSO. This was done to give the end-user an idea of when they should be reviewing the Employee History section of bCEnroll versus the benefitsCONNECT system. New Data Field in Employee History – Continuing in our efforts to help keep track of employee records changes, we added the data field of Username. While it will always show, it will be particularly useful for those groups utilizing the Username import field option. Employee Last Name Link – When bCEdge (or any API Integration) is enabled, the Employee’s Last Name link on the Admin side takes the user to the Employee History page. As soon as the API Integration is disabled, this link now takes the user to the ESS page without the end-user needing to clear their cache. Home Button Only – When a company is using our bCEdge software, an employee will now only see the “Home” button instead of the “Home”, “Change Password”, and “Logout” buttons. This was done to enhance the employee experience and to avoid any confusion in thinking that changing their password in our interface would change their password for the Summit HR site. The following is the best practice for creating a new Buy/Sell PTO benefit plan in bC4 for use in bCEnroll. Search for and select your Company. Click Company Administration and select Company Information. Click the Benefits tab and select Buy/Sell PTO. Complete the General Plan Design as you would any other plan and click Next. a. PTO Units are Based On – This is the increment in which the employee is allowed to Buy/Sell their PTO. If this is set to 2 Hours then an employee can buy or sell 2 hours at a time. The dropdown can be set to Hours, Days, Weeks, or Months. b. PTO Units Per Year – How many PTO Hours/Days/Weeks/Months total are available to an employee each year? This will auto-populate with the total amount an employee is expected to work in a year and should be changed to how much PTO is available to that employee. For example, if the PTO Units are Based On is set to “Hours” then this field will populate with 2080 which is how many hours an employee would work if they worked every week day for one year. c. PTO Units Allowed To Buy – How many PTO Hours/Days/Weeks/Months are available for an employee to BUY each year? This number should be able to be evenly divided by the number entered in the PTO Units are Based on field. For example, if the PTO Units are Based On has 2 (as in the example above) then this field should only contain even numbers that can be divided by 2.
d. PTO Units Allowed To Sell – How many PTO Hours/Days/Weeks/Months are available for an employee to SELL each year? This number should be able to be evenly divided by the number entered in the PTO Units are Based on field. 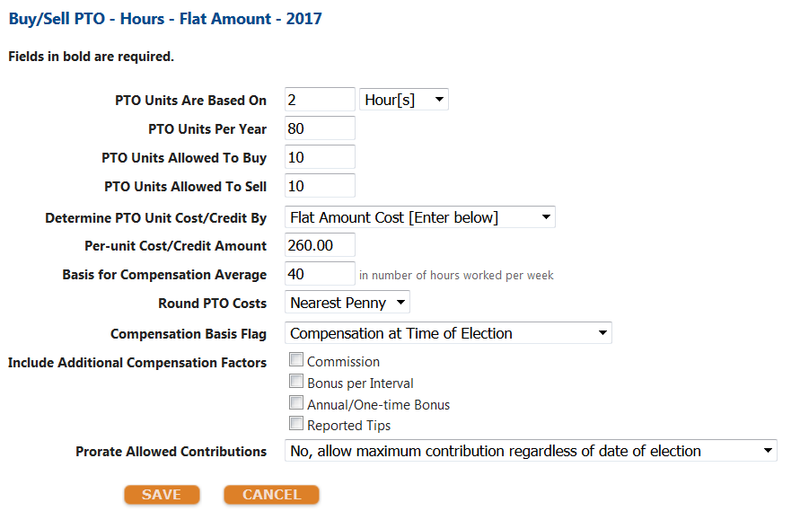 For example, if the PTO Units are Based On has 2 (as in the example above) then this field should only contain numbers that can be divided by 2.
e. Determine PTO Unit Cost/Credit By – This should be set to “Average Compensation per PTO Unit” meaning it will determine the what an employee would make in a given hour/day/week/month (pending which unit was initially selected) and determine the cost or credit based on how much the employee would have made had they been working instead of using their PTO. 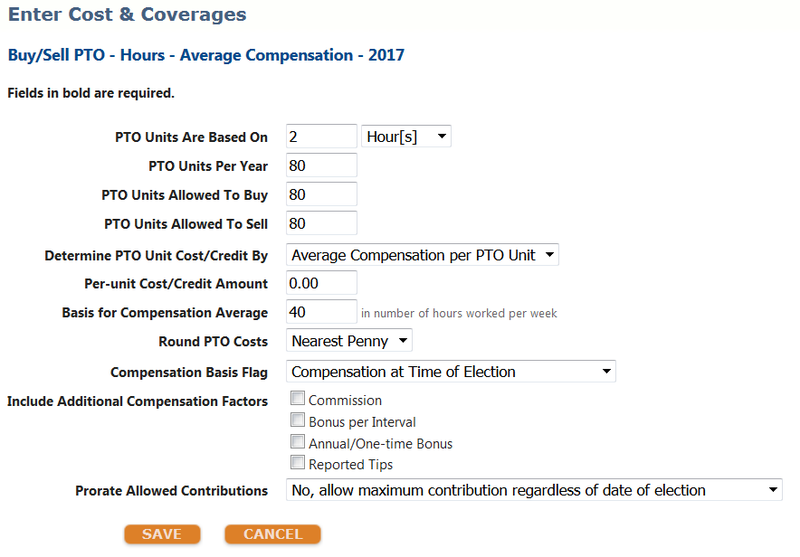 f. Per-unit Cost/Credit Amount – When using “Average Compensation per PTO Unit” this field should be left blank as it will have no bearing on the cost. g. Basis for Compensation Average – This field should reflect the average expected hours an employee would work in any given week in order to calculate an expectation of how much an employee would have made had they worked instead of used their PTO. For Full Time employees, this number is most commonly 40 hours. i. Compensation Basis Flag – Select what time of year should be used for an employee’s compensation. j. Include Additional Compensation Factors – This should currently be left blank. k. Prorate Allowed Contributions – This should be set to “No”. l. Click Next and proceed as you would with any other benefit plan. Now that we have reviewed how to setup a Buy/Sell PTO plan with the cost based on Average Compensation, the following is how to setup the plan with the cost determined by a Flat Amount. b. PTO Units Per Year – How many PTO Hours/Days/Weeks/Months total are available to an employee each year?This will auto-populate with the total amount an employee is expected to work in a year and should be changed to how much PTO is available to that employee. e. Determine PTO Unit Cost/Credit By – This should be set to “Flat Amount Cost [Enter Below]” meaning the cost or credit will be determined based on what is entered in the Per-unit Cost/Credit Amount field. f. Per-unit Cost/Credit Amount – This number should reflect the ANNUAL cost for a single unit. If an employee on a bi-weekly payroll schedule is selling hours and each hour costs $10 per-pay-period, the annual cost would be $260. 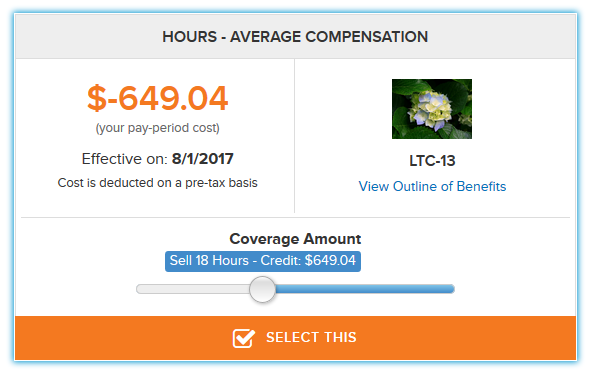 g. Basis for Compensation Average – To calculate an expectation of how much an employee would have made had they worked instead of used PTO, this field should reflect the average expected hours an employee would work in any given week. For Full Time employees, this number is most commonly 40 hours. 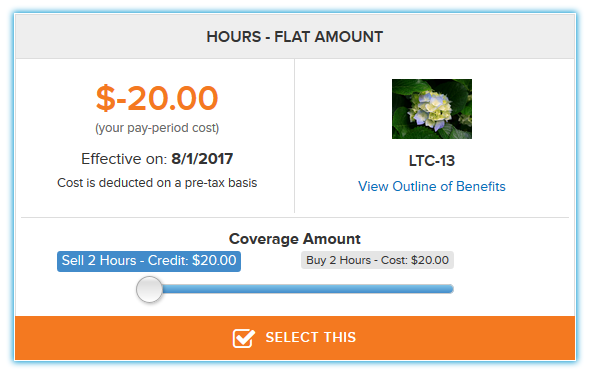 h. Round PTO Costs – For use in bCEnroll, this should always be set to “Nearest Penny”. i. Compensation Basis Flag – When using “Flat Amount” this field will have no bearing on the cost.